Well I told you that this year I was going to keep track of Aurelia Cristea this year and what she does (or doesn’t do) for Unicorn City now that she’s a member of parliament. So you can imagine my surprise when I turned on the news this morning and saw her face alongside the headline “USL MP has a million Euro house” (in Romanian – no link at the moment but it’s been running on B1 all day). Likewise Adevarul tell us about Cristea’s house that’s worth “almost 800,000” euros. And there are pictures of this luxurious mansion everywhere. Sheesh. 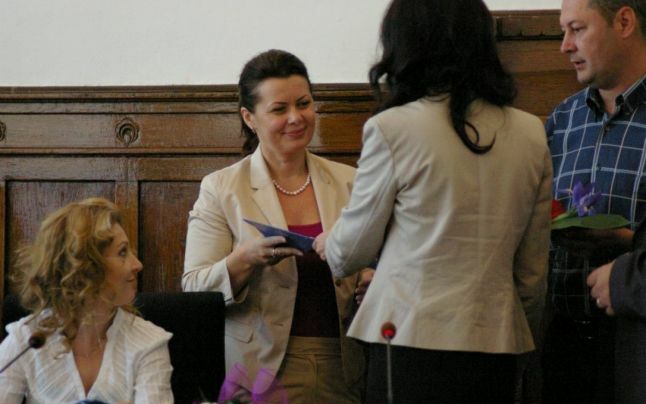 In reality what ACTUALLY happened is Aurelia Cristea put her house up for sale in the normal fashion, in this case listing it with RE/MAX here in Cluj and a reporter from Evenimentul Zilei found out about and posed as a buyer and so called her up and asked her about it. Wow. And the listing is for 750,000 euros, admittedly expensive but not “almost 800” and certainly not a million and she told the fake EVZ “buyer” that she was willing to sell it for 700. Is it a nice house in a nice neighborhood? Yes it is. Did she declare this house in her mandatory holdings filings (as politicians are required to do)? Yes she did. Is there even the slightest hint of wrongdoing, corruption or criminality involved? No. She worked in the private sector for a long time and apparently earned the money legitimately and then had a nice house built. So what is the story here? The story is there is no story, of course. Even the comments on the news sites are all about how confused everyone is about why it’s even mentioned. Sounds to me like EVZ (and B1) ran it simply as a broadside against the USL, to whom they are intellectually opposed and pitiful old Adevarul just copied it. Find me a shred of corruption or criminality and I’ll be the first in line to condemn her but otherwise the woman has a right to sell a house she paid for and furnished quite nicely (that kitchen is awesome). Personally I like the little grouping of religious icons on the wall near the main entrance, that’s how you know it’s a Romanian house despite all the imported Italian fixtures. Maybe I’ll call up RE/MAX and ask them how they feel about being duped by EVZ. Ah, now THAT would be a story, eh? Sorry bastards need to learn how to do a little real journalism. How so? You offer accusation with no evidence? At least provide something cooked up.